M0PLA/P SOTA Activations: 10th February 2018. Corndon Hill SOTA Activation visit. 10th February 2018. Corndon Hill SOTA Activation visit. Grid SO 306969, Altitude 513M. My return visit to Corndon Hill for 2018, I decided to park a little closer this year and attempt a different ascent route. Last January we came down clockwise around the forest area and had decided to try ascending this route next visit. We parked at GD SO 29989677 this is about 600 meters further down the track through the gate where we would usually park . I could not see any signs saying private and my map says road used as a public path. There was a farmer feeding his sheep and he just waved back as we waved to him. We had planned to activate Long Mynd Pole Bank before this but again the Burway was closed due to snow and ice.The new route for us took about 20 minutes from leaving the car and if our fitness level was higher than it is at the moment would have been a lot easier than the near vertical climb that we would usually go up. This is the route we shall use in the future and strongly recommended to any others. The weather was cold and very windy, Jamie (M6SZF) had to have one hand on the small mast/pole we use for the 2M Yagi (Homebrew) that we usually use as if would have been blown away. This was going to be my first activation with purely my Yaesu FT 270 handheld and my light weight Yagi. No FT 817 in the back pack as a back up. 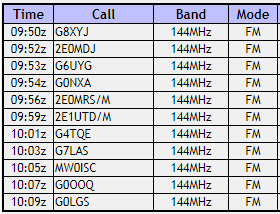 I had 11 QSO's from various locations. After the 20 minutes of activation's we packed up quickly had a quick coffee and headed back to the car, we were very cold but ready for the next visit to a summit, maybe try Pole bank again if no snow in the near future.